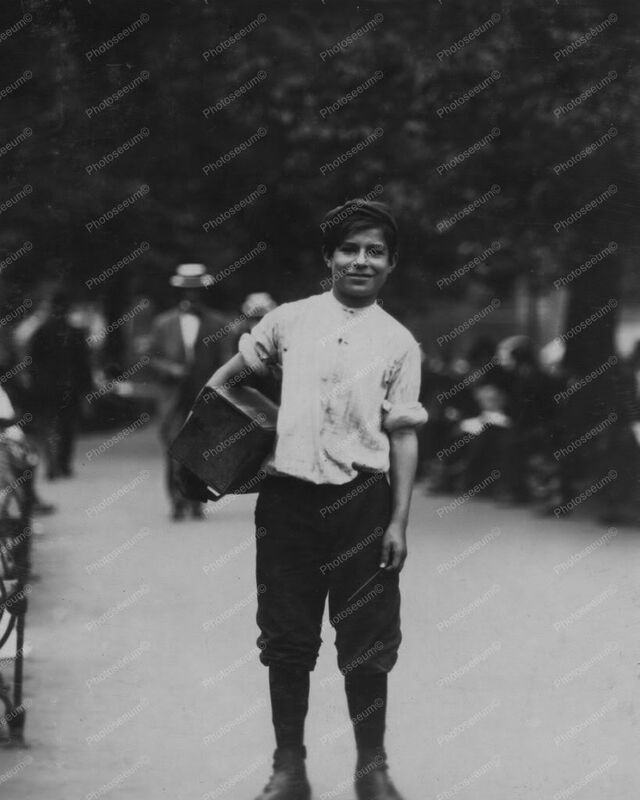 Here is a neat collectible depicting a shoeshine boy also known as a "bootblack" working during the 1910s. Bootblacks were young shoeshine boys who worked before child labour laws were passed. Vintage 8x10 Reprint Of photo. Reproduced photo is in mint condition. This photo will be shipped protected in a padded mailer. Check out my other photo's and vintage collection in my Shopify Store. Please note the Photoseeum fine print in the foreground of all the photos will not be in the printed version you purchase. All of our photos are developed in photo labs, using the finest photography stock available such as Kodak & Fuji or other quality brand name product. We do not print off our photos on cheap inkjet home printers, like so many other photo sellers here on Shopify. The old saying here applies....you get what you pay for.